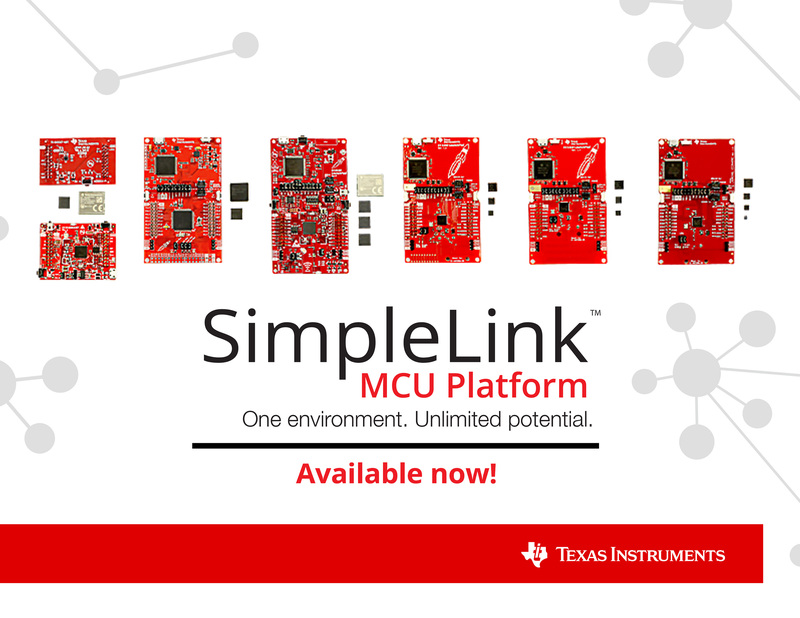 DALLAS (March 15, 2017) –Available today, the new Texas Instruments (TI) (NASDAQ: TXN) SimpleLink™ microcontroller (MCU) platform is transforming the pace of product proliferation by uniting a robust set of hardware, software and tools under a single development environment. Built on a shared foundation of drivers, frameworks and libraries, the SimpleLink MCU platform’s new software development kits (SDKs) enable scalability with 100 percent code reuse, reducing design time and allowing developers to invest once and leverage across multiple products. With the ability to choose any device from the industry’s broadest portfolio of 32-bit wired and wireless ARM®-based MCUs, Internet of Things (IoT) and industrial products can easily adapt to changing design or application requirements. 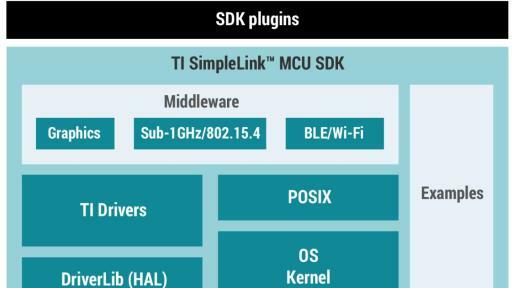 Expanding the device offering of the SimpleLink MCU portfolio, TI today also announced a new generation of Wi-Fi chips and modules – the new SimpleLink Wi-Fi CC3220 wireless MCU and CC3120 wireless network processor. The CC3220 products are built on a novel architecture, with two physically separate execution environments in a single chip. The CC3220 devices include rich embedded security features such as secure storage, cloning protection, secure boot and networking security. Through these new features, developers now have powerful tools to help them protect IoT devices from intellectual property (IP) and data theft or other risks without using an external secure MCU or element. In addition, like other SimpleLink products, these new devices enable Apple HomeKit technology. Continuing to deliver the lowest power, easy-to-integrate Wi-Fi CERTIFIED™ solutions, the CC3x20 family of devices empowers designers to create products that can be sent to production in six months and can run on two AA batteries for years. For more information, see www.ti.com/simplelinkwifi-pr. 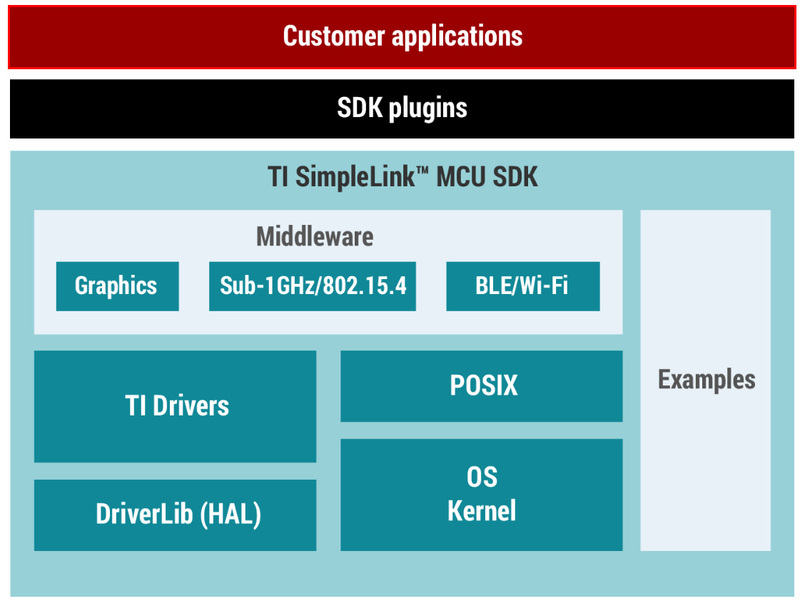 TI Drivers and industry-standard POSIX application programming interfaces (APIs): The SimpleLink SDK lowers the barrier of entry with the introduction of TI Drivers, an intuitive set of standardized functional APIs. Additionally, Portable Operating System Interface for Unix (POSIX) –compliant APIs are supported to offer 100 percent application code portability with numerous OS/kernels. Unified tool chain: Tools, training and resources, including modular TI LaunchPad™ development kits; free cloud tools; and on-demand access to code examples, documentation and training are available through TI Resource Explorer and SimpleLink Academy at every point in the design cycle. 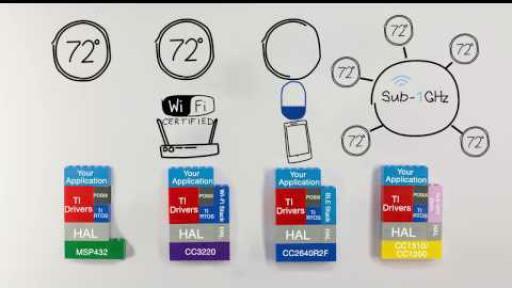 Integrated connectivity stacks: The portfolio offers a diverse range of wired and wireless connectivity standards, including Bluetooth low energy, Wi-Fi, Sub-1 GHz and RS485, with zigbee®, Thread and Ethernet coming soon. Developers can get started immediately. CCS Cloud, a browser-based version of the Code Composer Studio™ integrated development environment, is available as an online resource to start development for free, even before purchasing a development kit. For those with LaunchPad development kits, SimpleLink MCU SDKs are available for immediate download. 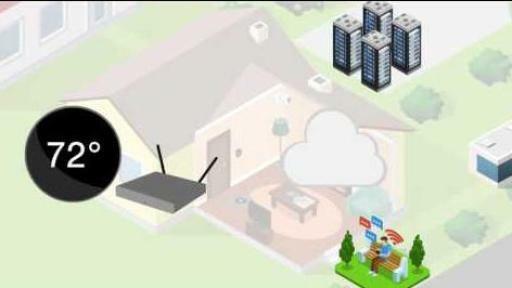 Pricing and availability for all SimpleLink devices and development kits can be found at www.ti.com/simplelink-pr. The new SimpleLink Wi-Fi CC3x20 MCU-based development kits are available now through the TI store and authorized distributors. The CC3220 wireless MCU LaunchPad development kit [CC3220SF-LAUNCHXL] is available for US$49.99 and the CC3120 wireless network processor BoosterPack™ plug-in module [CC3120BOOST] is available for $29.99. The CC3220 wireless MCU is available starting at US$4.99 in 1,000-unit quantities. The CC3120 wireless network processor is available starting at US$3.79 in 1,000-unit quantities. The CC2640R2F wireless MCU is available starting at US$2.00 in 1,000-unit quantities. The CC1350 wireless MCU is available starting at US$3.50 in 1,000-unit quantities. The CC1310 wireless MCU is available starting at US$2.20 in 1,000-unit quantities. The MSP432 MCU is available starting at US$2.65 in 1,000-unit quantities. The CC3120MOD module will be available at US$8.39 in 1,000-unit quantities. The CC3220MODS module will be available at US$9.39 in 1,000-unit quantities. The CC3220MODSF module will be available at US$10.59 in 1,000-unit quantities. Explore the platform with Project Zero in the new SimpleLink Academy. Get started with the free CCS Cloud. Watch a video about 100 percent code portability. 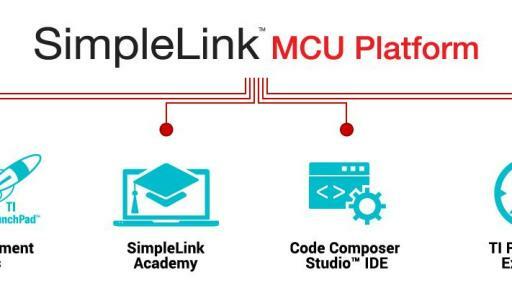 The SimpleLink MCU platform from Texas Instruments is a single development environment that delivers flexible hardware, software and tool options for customers developing Internet of Things (IoT) applications. With a single software architecture, modular development kits and free software tools for every point in the design lifecycle, the SimpleLink MCU ecosystem allows 100 percent code reuse across the portfolio of microcontrollers; which supports a wide range of connectivity standards and technologies including RS-485, Bluetooth® low energy, Wi-Fi®, Sub-1 GHz, 6LoWPAN, zigbee®, Ethernet, Thread, RF4CE and proprietary RF. SimpleLink MCUs help manufacturers easily develop and seamlessly reuse resources to expand their portfolio of connected products. www.ti.com/simplelink. BoosterPack, Code Composer Studio, LaunchPad, MSP432 and SimpleLink are trademarks of Texas Instruments. All registered trademarks and other trademarks belong to their respective owners. 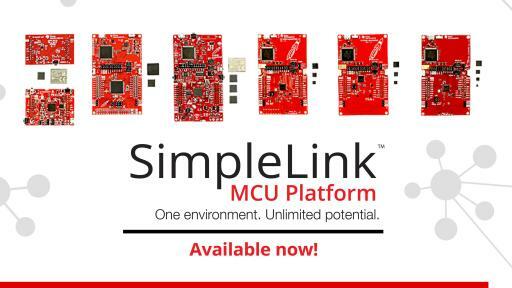 Excited About The SimpleLink™ MCU platform?